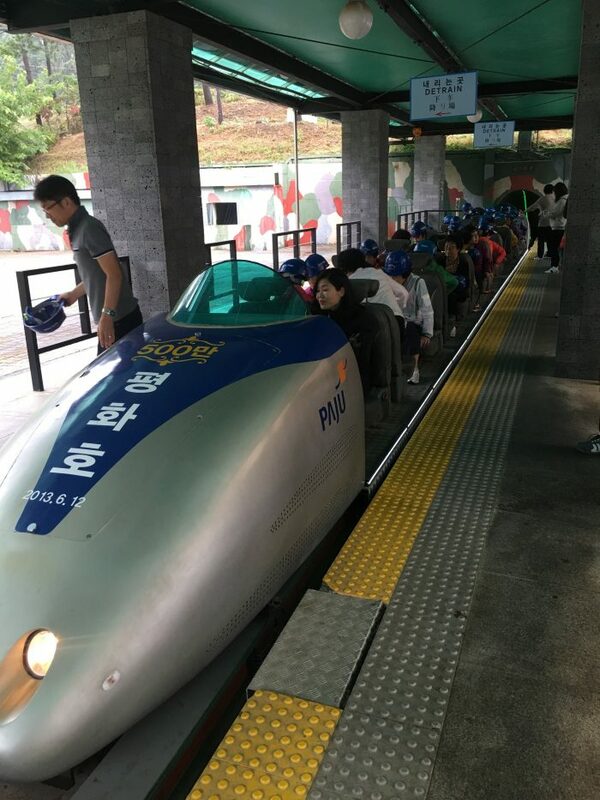 While visiting trendy, technologically-advanced Seoul, it’s easy to forget that just an hour away lies an entirely different world across one of the most heavily fortified borders in the world, the South Korean border with North Korea. The two countries have remained in a standoff since the end of the Korean War in 1953. No treaty was ever signed between the two, even when the fighting stopped, resulting in the current state. The border is more than just a line, but instead a demilitarized zone (DMZ) that is nothing of the sort. 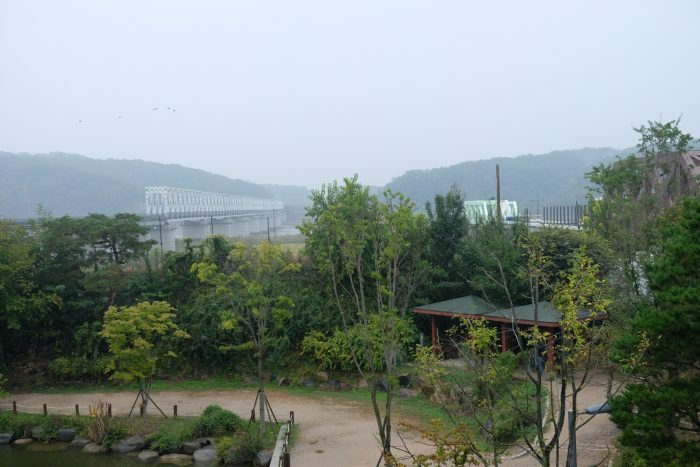 If you’re interested in history, you can take an organized DMZ tour from Seoul. 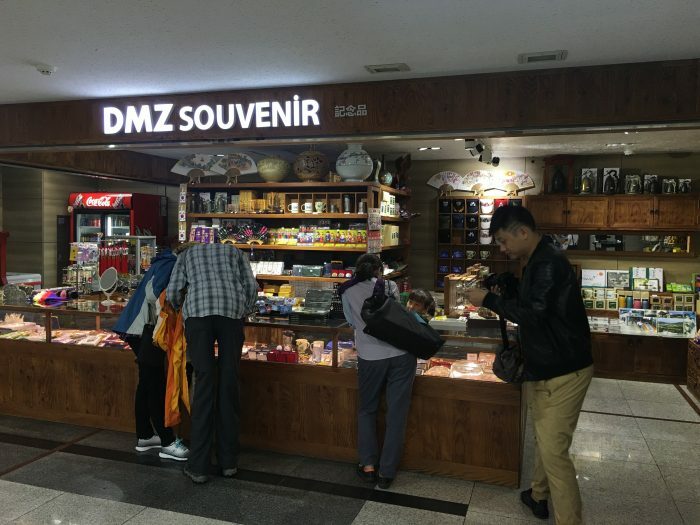 There are a few companies offering DMZ tours from Seoul, but I chose to go with Tour DMZ (tourdmz.com). They offer a few different tours, but I opted for the full day combined tour. This combines a trip to Panmunjom, inside the DMZ, along with the 3rd Tunnel, a tunnel that North Korea dug into South Korea. I booked a few days ahead of time. I was lucky to be able to get a spot at the last minute. The combined tour is only available on some days. The total cost was 130,000 won (around $115 USD). For more DMZ tour options from Seoul, see below. When you book the tour, you are given full instructions about how the day is going to go. Since the DMZ is an active military zone, this is not the time for you to think that the rules don’t apply to you. You will need to bring your passport with you. There is a dress code, and you are only allowed to take photos at certain times. The dress code isn’t anything too strict. Don’t wear open-toed shoes, torn clothing, and revealing or military clothing (or revealing military clothing, if you’ve still got that slutty tank costume with you from Halloween). I was surprised that a couple of the guys on my tour were allowed to be wearing a ton of khaki & olive cargo clothes, along with a shirt that said “Don’t Tread On Me”. 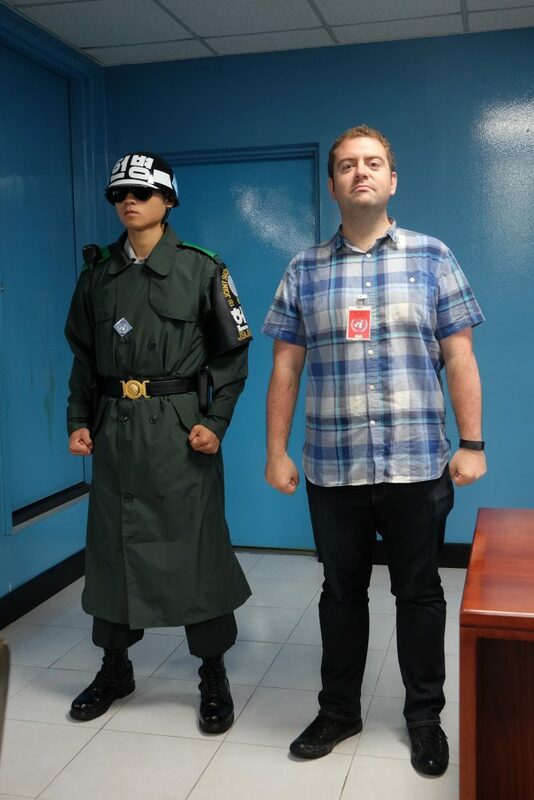 Seriously, that’s a dumb outfit to wear if you’re doing a tour of the DMZ. The tour began around 7:30 in the morning at the Hotel President. The hotel is near City Hall station in central Seoul. You pay when you get there, and then they give you a seating assignment for the bus. I managed to have a window seat despite having booked at the last minute. 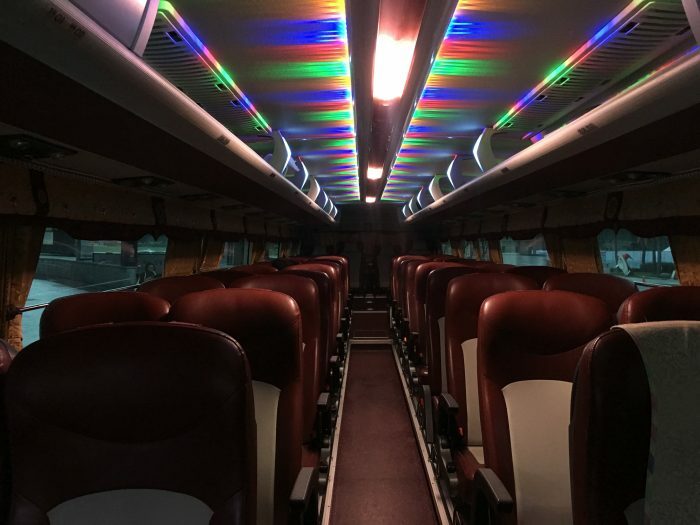 The bus looked like a party bus inside. It also had nice air conditioning. While I waited for the rest of the DMZ tour participants to arrive, I ate sweet potato & cheese steam cakes from Paris Baguette. We set off on our journey. While we took the one hour drive to the first checkpoint, our guide, Sujin, gave us information. First she spoke in English for half the time, then she spoke in Japanese. There were 36 English-speaking visitors on the tour, and 6 Japanese speakers. As you approach the DMZ, the road to the north gets emptier and emptier. There are watchtowers and barbed wire along the left side, bordering the water. 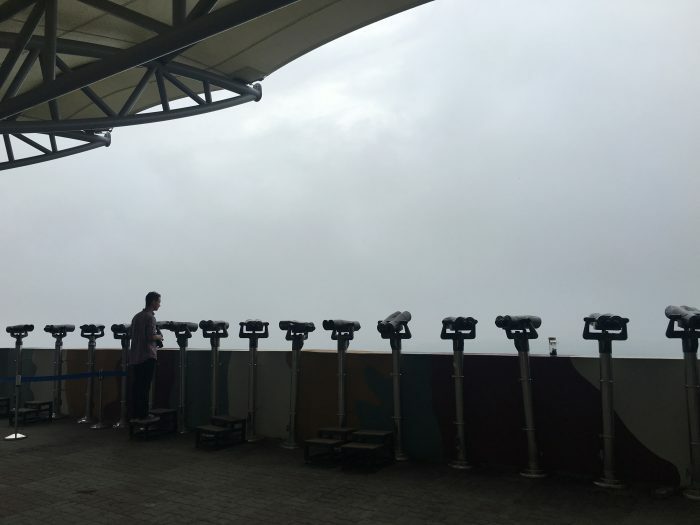 It was a rainy, dreary day, which lent an ominous overtone to the whole visit. Finally, we crossed the Unification Bridge, also known as the Cow Bridge because the founder of Hyundai, who had been born in the North, sent 1001 cows over it as a gesture of goodwill & interest toward his village. Past this point, photography is limited, as you are inside a military zone. This still is not the DMZ, but it’s getting much closer. The first stop of the DMZ tour from Seoul is at Camp Bonifas, about 400 meters outside the DMZ. 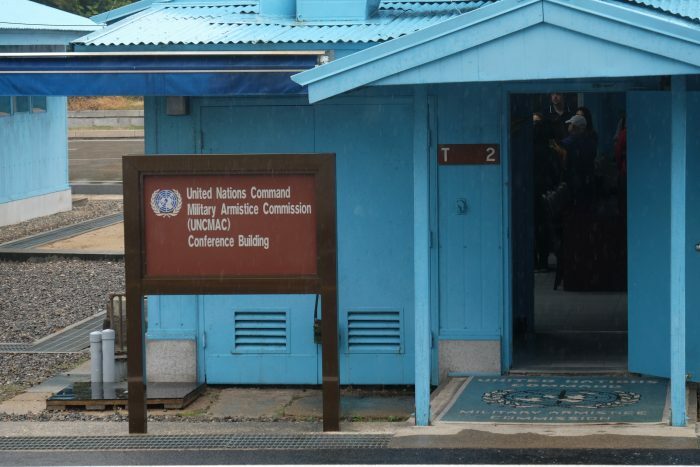 The camp hosts the visitors center for DMZ tours, led by South Korean & American service members as part of the United Nations Command DMZ Orientation Program. The border between South Korea & North Korea contains the last vestiges of the Cold War. The two sides have been at a stalemate for decades, with occasional skirmishes flaring up. 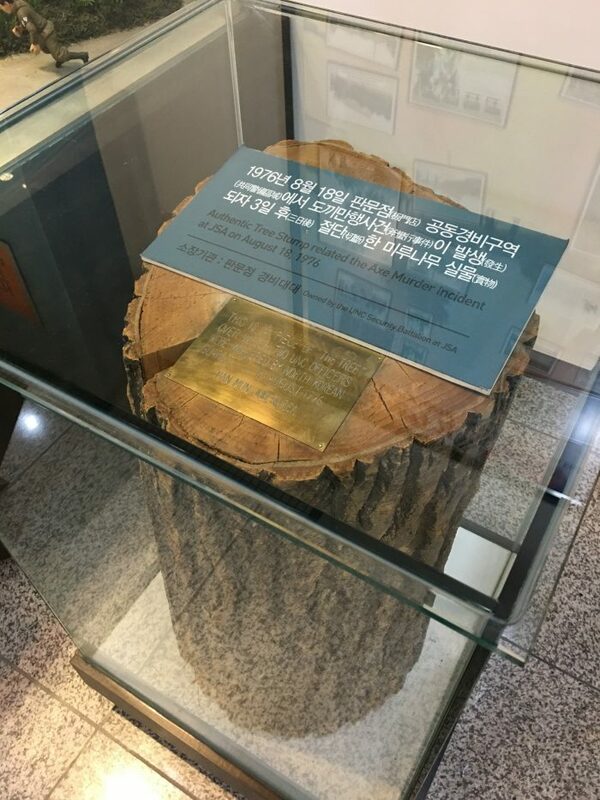 The camp is named for U.S. Army Captain Arthur G. Bonifas, who was killed by North Koreans in 1976 during a fight over a tree being cut down inside the Joint Security Area (JSA). There are many stories like this from inside the DMZ. You can see the document, along with more information about the protocols (including maps), inside this PDF. You are made well-aware that this is in fact still a war zone, even if incidents are rare. After signing our permission slips, military personnel gave us a briefing about the history of the area. The whole day is fascinating if you are interested in history, as you are constantly learning new tidbits. Next, we were herded back outside to get on a UN bus. This bus took to our next stop, the Joint Security Area. While the DMZ stretches along the entire border between South Korea & North Korea, the JSA is a special area with a complex where both sides are face-to-face. 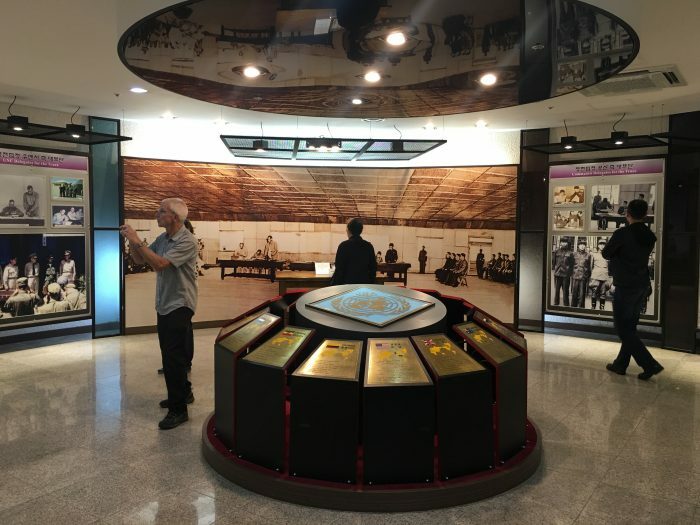 Inside the JSA, also known as Panmunjom, each country has a visitor building on their side of the border. Along the border itself sits a row of conference rooms. 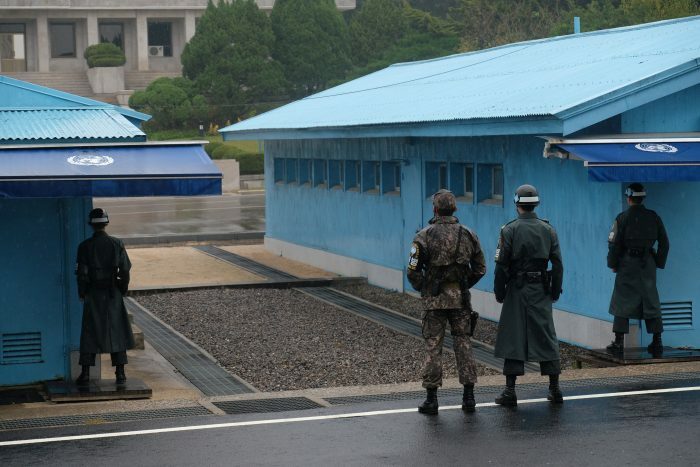 On the South Korean side, soldiers stand watch. You are being watched by North Korea as well. The conference rooms are used for meetings between the two nations. 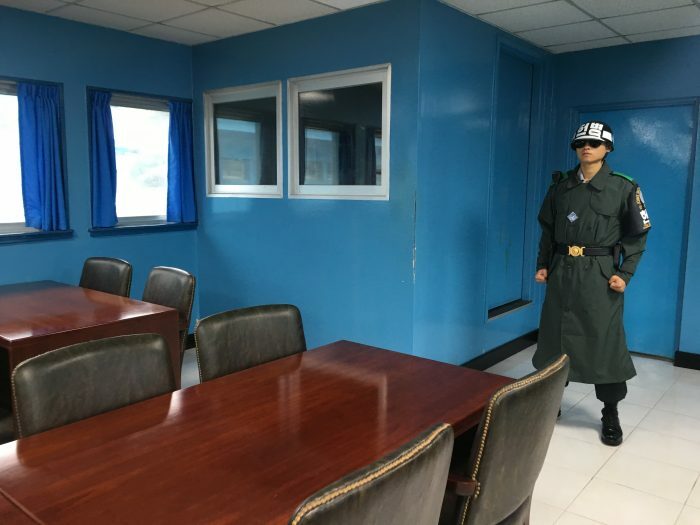 When you go to the far end of the room after entering from the South Korean side, you are inside North Korean territory. 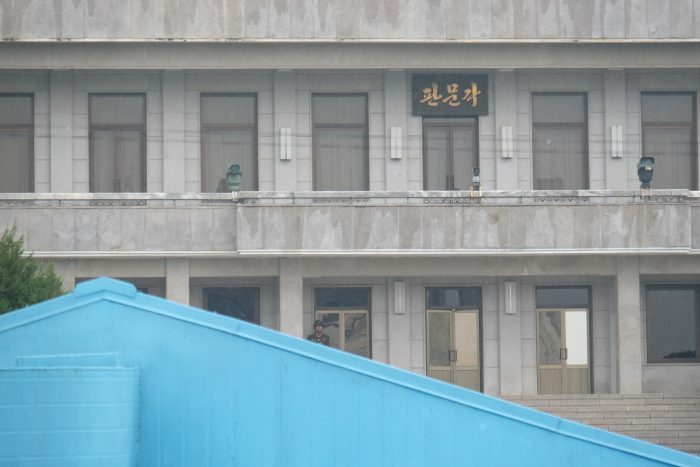 Everyone posed for photos inside North Korea. Conan O’Brien visited the DMZ during his trip to Seoul, not long before I visited there myself. Here’s the video of his tour of Panmunjom so you can get a better sense of the area. 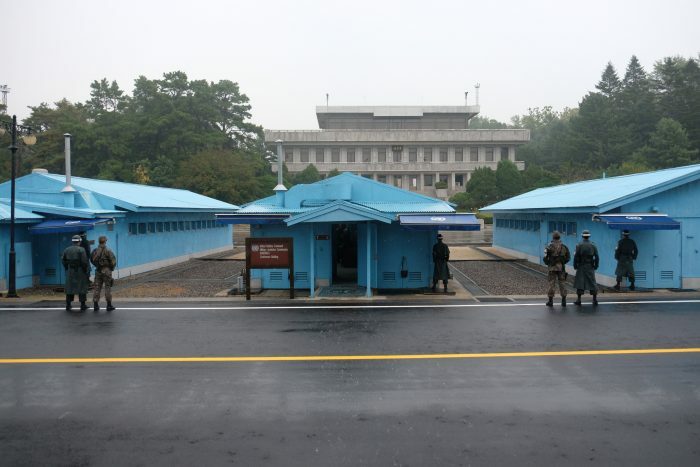 Your visit to the DMZ might have a slightly different itinerary, depending on the current security situation. We were not able to go to Checkpoint 3 or the Bridge of No Return on our visit. 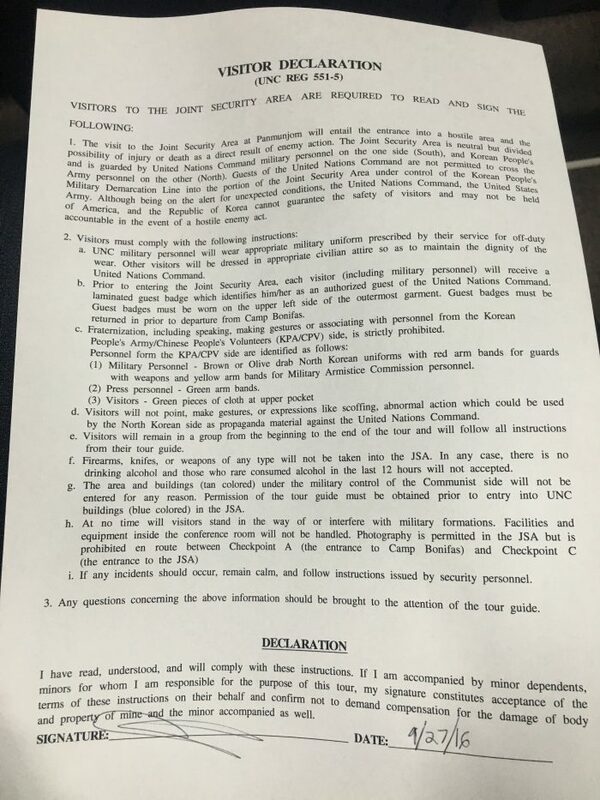 Some tours are unable to go to Panmunjom at all. After making our stop at the JSA, we headed back to Camp Bonifas to visit the museum & gift shop. Next, boarded our original bus and headed to the Freedom Bridge & Imjingak Park. 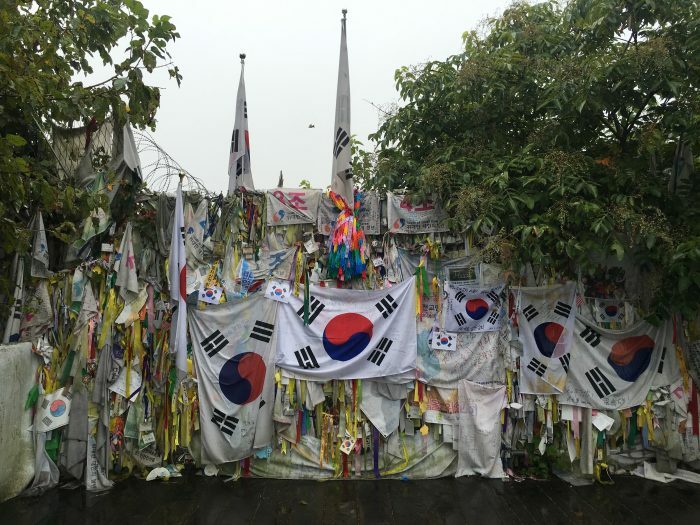 The bridge & park host several monuments & give opportunities for displaced Koreans to remember their loved ones & homes. Visitors attach messages to the bridge, which was once used to exchange prisoners at the end of the Korean War. 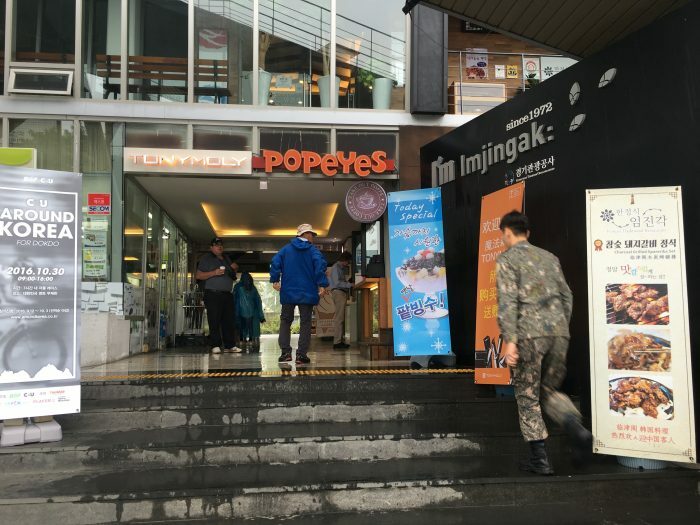 Imjingak has an odd combination of remembrance & tourism, as the melancholy of the memorials is at odds with the on-site amusement park & Popeye’s, especially on a rainy day. 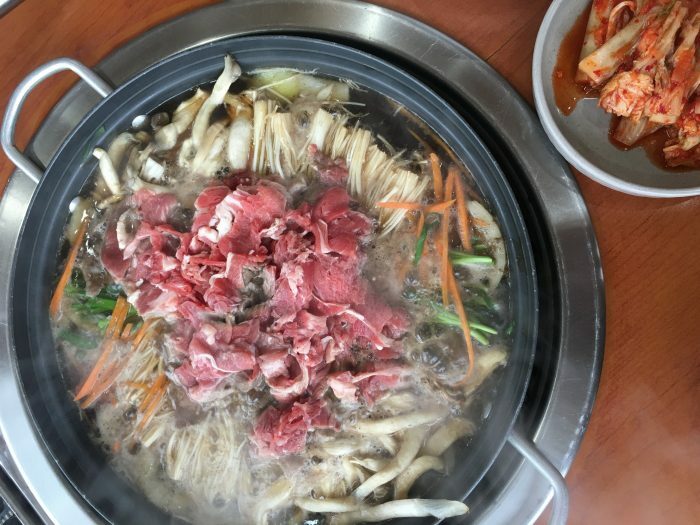 We got back on the bus to drive a short distance to our lunch spot, rather than staying at Imjingak. 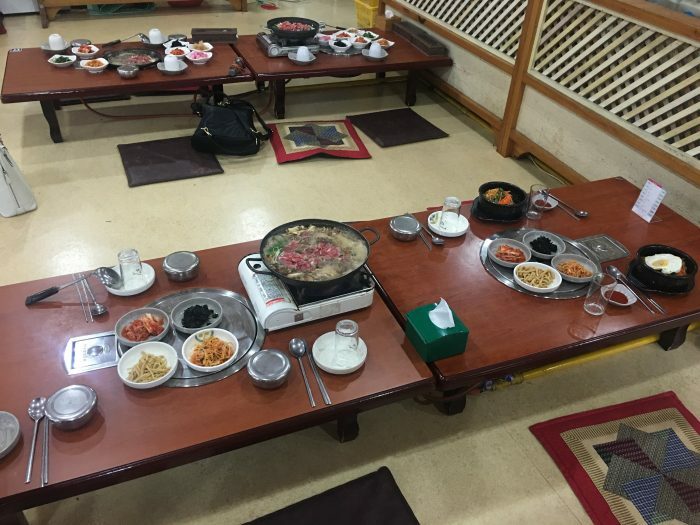 We had bulgogi & bibimbap while sitting on the floor of little hole in the wall restaurant. While it wasn’t the most amazing place, it was at least somewhat more authentic than a visitor’s center. After lunch, we headed back toward North Korea. We passed through another checkpoint at the entrance of a vacant economic cooperation area. South Korea is preparing for the eventual reunification with North Korea. If & when that day comes, there is going to be a lot to deal with since the countries have gone on divergent paths since the Korean War, but there is some infrastructure in place. Part of this infrastructure is a railway line that operated for about a year between the two countries, but is currently shut down. 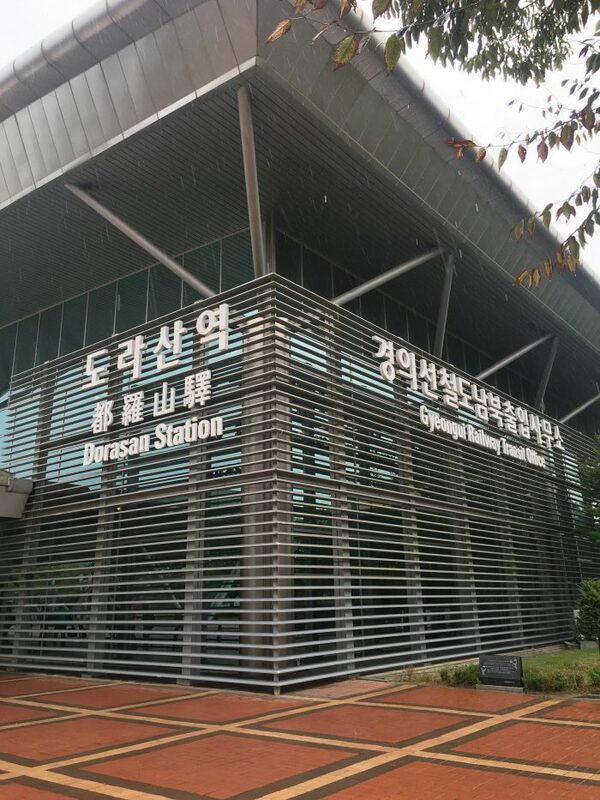 Nowadays, tourists can take the train from Seoul to Dorasan station. 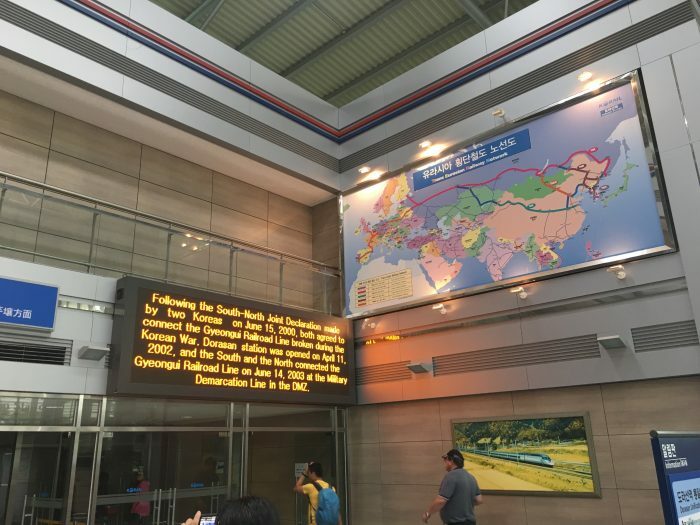 There’s not a lot to see at the station, but it’s interesting to see what could eventually be an important connection in the reunification process. The idea is that someday the rail network will connect to the rest of Asia & Europe. 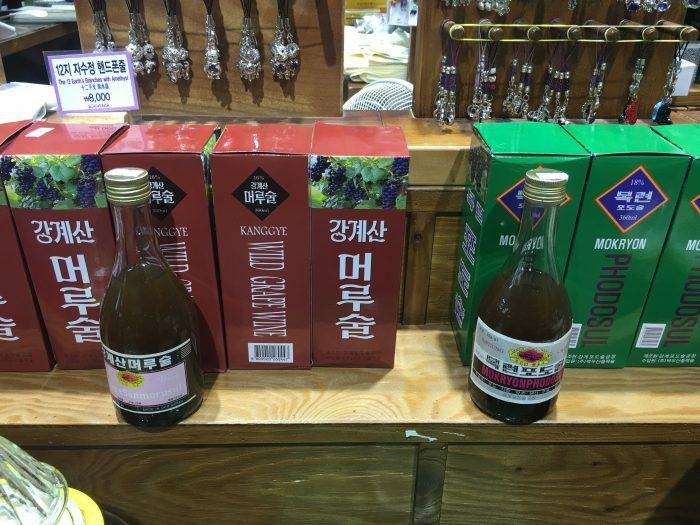 There is a gift shop inside Dorasan station that sells some North Korean products, including wine. I’ll try almost anything, but even I have my limits. That stuff looks rancid. Next, we rode the bus up a hill to the Dora Observatory. From this hill you can see for miles across the DMZ, Panmunjom, and into North Korea, all the way to Kaesong. Theoretically. Thanks to the mist, all we could see was a wall of grey. North Korea is in there somewhere. After taking in the view, we went into an auditorium where we watched video about the history of the area & the Korean War. It was interesting to learn more, though the video leaned heavy on the propaganda side when it really didn’t need to. Our final stop of our DMZ tour was at the Third Tunnel. 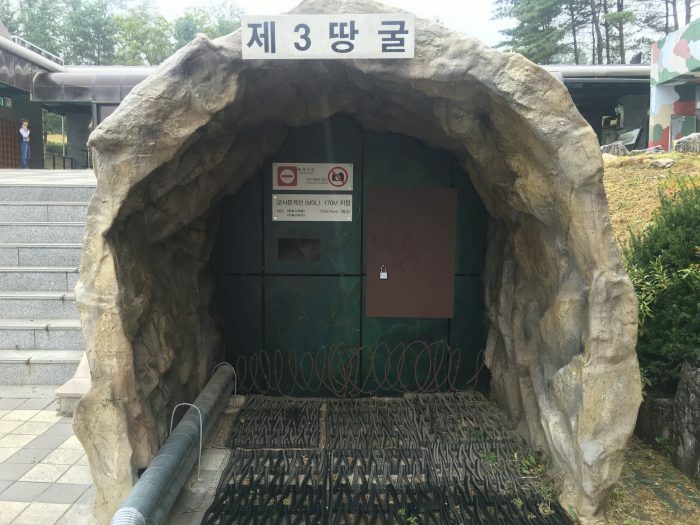 Over the decades, North Korea has made a few attempts to tunnel their way into South Korea, with the idea of being able to invade deep underground if war breaks out again. So far, South Korea has unearthed four major tunnels. The North Koreans claimed they were natural caves, but blast marks from dynamite pointing north, west, and east demonstrate otherwise. Before beginning our descent, we had to leave our cameras in lockers at the entrance, since photography is not allowed. The tunnels are too narrow to allow people to stop and take selfies. There is a mockup of the tunnel outside that has been constructed for that purpose. The Third Tunnel is far underground, so South Korea constructed a special steep tunnel to provide access to it. This part of the tunnel is well-constructed, although steep. Beyond this, the ground is flatter, but the construction is far shoddier, as North Korea wasn’t building it for comfort. The ceilings are low & uneven. Visitors are given hard hats. The hard hats are necessary. I just barely brushed my head on the low ceiling and pipes a few times, but I could hear the repeated thwacks of plastic on rock throughout my visit. The tunnel dead-ends at a locked door. Beyond this is North Korea, but of course this passage has long been sealed off, denying access. Once you’ve made it to the bottom of the tunnel, you need to make it back to the surface. There is a train that takes people into the tunnel and back. Unfortunately, our tour did not include this service. As a result, we had to make the steep climb up. I made it back up without stopping, though just barely. It’s a good 450 meters or so, up a steep ramp while dodging other visitors. It’s a fairly strenuous climb, so take note if you have health issues or a disability. Back at the surface, we headed to the film room across the parking lot. Here we watched a nine minute film about the Korean War. Once again, it was a bit heavy on the propaganda of reunification at the start. The second part of the movie was more interesting & discussed something that most people won’t realize. One consequence of the presence of the DMZ is that there is a strip of land across the Korean Peninsula that has very little human activity. This barrier has allowed nature to thrive, essentially allowing for a wildlife park that stretches across the whole border. In a place of such ugliness & warfare, there is also great beauty. Following the video, we headed back to the bus. 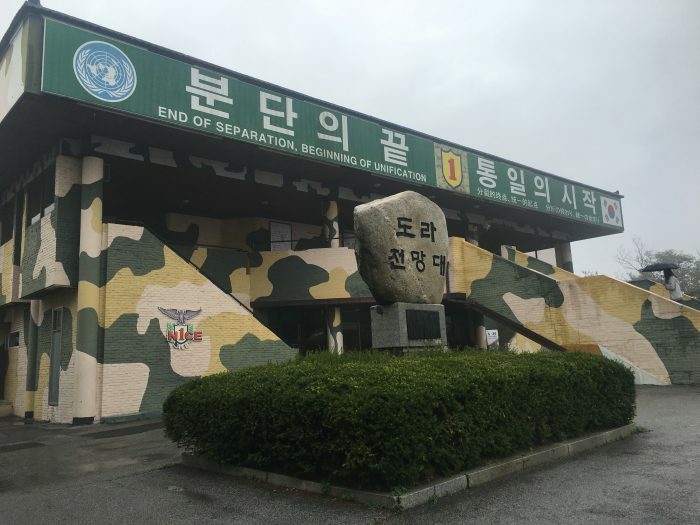 Our DMZ tour was over, and it was time to go back to Seoul. We drove back the same way. 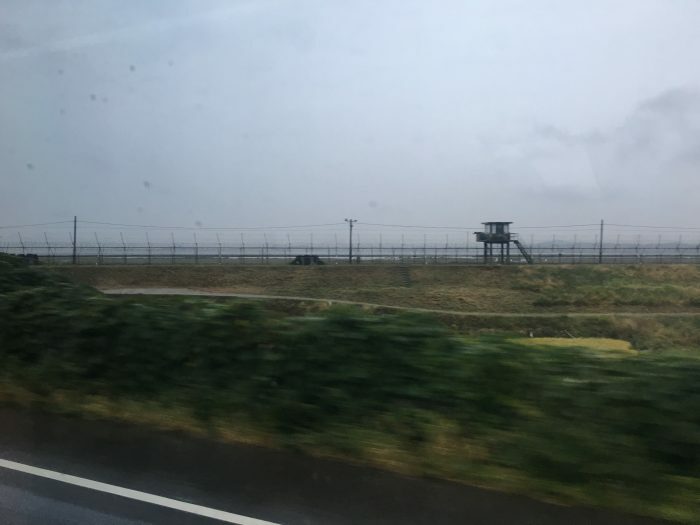 This time the right side of the bus saw the fences by the water and North Korean land on the other side. We arrived there around 4:15, having spent a full day along the border. My DMZ tour from Seoul was an interesting way to spend a day. It’s certainly a unique experience. I do wish that the history that’s presented went a bit deeper, but I get why it didn’t. It would have bored most people to death. 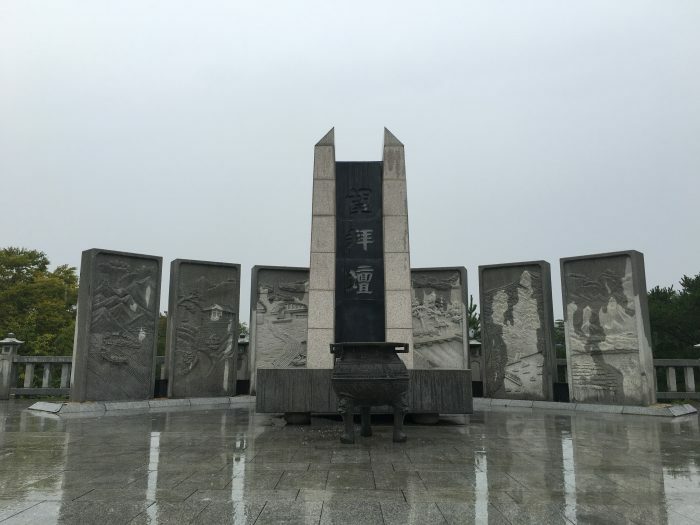 For more background, The War Memorial of Korea would be a good place to visit before taking a tour of the DMZ. Unfortunately, I didn’t manage to get there before or after. 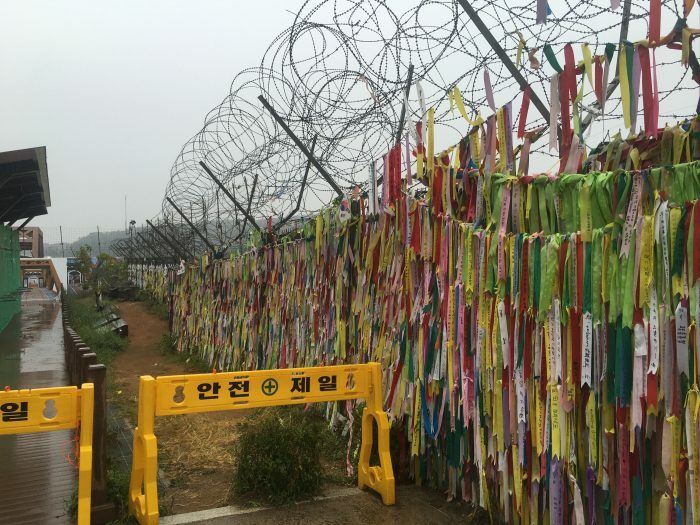 A visit to the DMZ might not be at the top of everyone’s list when they visit South Korea. However, if you’re interested in getting to know the history & politics of a place you’re visiting, the DMZ tour makes for a fascinating day trip from Seoul. You leave with a much better sense of just how close North Korea is to Seoul, the disruption the separation has caused, and just how damaging another war between the two countries would be for both sides. As new threats are being made, one can only hope that peace will endure & the people of North Korea will one day live as comfortably as those in the South.